Great fishermen know that fall in West Michigan not only brings spectacular color, but some of the greatest fishing around. Due to less boat traffic, your chances of catching a salmon or steelhead this time of year are better than ever. From Manistee and the Manistee River down to the Ludington and Pentwater area in West Michigan, you have your choice of wide open water in which to catch "the big one." The Hamlin Dam at the Ludington State Park is a great location to try your luck, especially during the fall salmon run. Salmon, steelhead, and trout swim along and below the dam during the fall, providing terrific fishing opportunities. Read Hamlin Lake Fishing Reports. 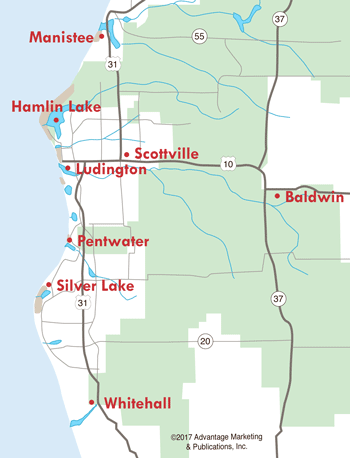 Many fish that are headed north tend to stay around the port of Ludington, so Lake Michigan fishing in the fall is a virtual "gold mine." Pere Marquette Lake is popular for those who like to fish for brown trout and salmon. Fly fishing in the Pere Marquette River yields steelhead and trout, and the sizes of fish caught are outstanding. Read the most recent Pere Marquette River Fishing Reports and plan your fishing trip today. Don't miss the thrill of catching your limit on the Manistee River. 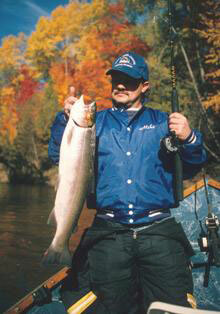 Check out the Manistee River Fishing Reports for the latest action. So if you love to fish, especially in the fall, West Michigan is where you want to be!